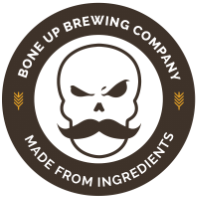 Stats: Clusterbomb - Bone Up Brewing Co. Cheese Pairing: Cheese curds (ideally as part of poutine). Queso fresco and/or snacking cheese are also acceptable. Food Pairing: Bacon cheddar burger. Best Occasion to Drink: Whilst perusing the Bone Up taproom library for a good comic book to get lost in. Brewer's Notes: This is the second entry in our loosely-defined series of single-hop beers made with hops that nobody cares about. This time around we're focusing on Cluster - an old-school American hop that combines lemony citrus character (in times of shortage, it's used as a substitute for Cascade) with a bit of Wild American earthiness. It's a cool lil' hop, and we're showcasing it by using it in a a solid caramel-forward pale ale base that leans a ways toward the red end of the color spectrum.